My thanks go to several individuals that have regularly assisted with areas to ‘ratch’ ( AB’s terminology for a brick hunt), information on bricks, advice, finding bricks and indeed accompanying me on outings. HB – Harry Baird, Stenhousemuir. 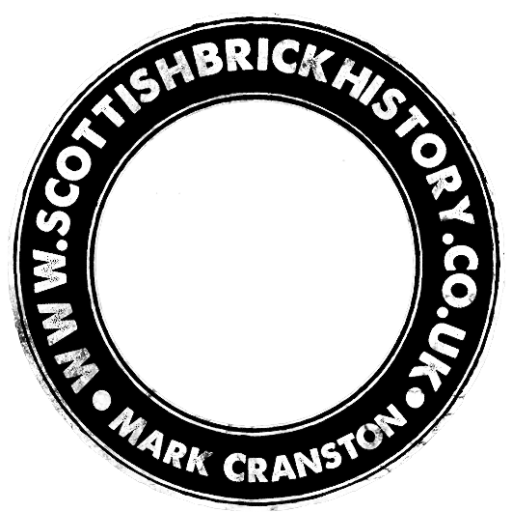 Michael Fallone, Glasgow – Michael has been collecting bricks since the 1970’s and allowed me to search through his brick treasures for any examples not currently in my collection. His subsequently donated these bricks to the Cause and they now form a valuable part of the database. I would have been unlikely to find many of these bricks myself and indeed some may not be available to find anywhere. Many many thanks. Gordon and Hazel Wyle, Alva – My huge thanks go to Gordon and Hazel. Their assistance in collecting bricks and other examples and their tireless assistance to the project is always very much appreciated. Their hospitality, generosity and assistance with research is undoubtedly above and beyond. You get a good story too…ask them about the goldfish that died as a result of an accident with a pear! Eddie Mclean – Eddie is a font of info when it comes to looking for old derelict sites in Glasgow and he has come up with some fantastic finds which would have taken me forever to find for myself. His time, hospitality and services as a guide are all very much appreciated along with his many many great finds. Tucker Kennedy – A man on a mission to find bricks! His assistance in finding bricks and showing me around Stranraer is above an beyond. He has taken this project to heart and he and indeed his good lady Susan, are out in all weathers on the hunt for new additions to the collection. Above and beyond is an understatement. I really do appreciate all the help given. Jean Cochrane, Fife – Jean has been collecting for many years and in a very generous gesture indeed she has also given me all the bricks in her collection that I do not have in mine – there are some crackers! I cant thank you enough Jean and rest assured they will be well looked after. Steven Pattison, Paisley – for picking up bricks while delivering in and around the Paisley area. He has found some cracking examples. One eye for driving and the other for catching a fleeting glimpse of a half hidden brick! Bill Speirs, Renfrewshire – who has picked up some lovely bricks while out walking in his local area….some I thought it might take a lifetime to find if ever! He has kindly forwarded pictures of these for the site and also donated many lovely examples. Ian Suddaby, East Lothian- for his knowledge and expertise in the field and for keeping a look out for bricks on his travels. Roddy Ramjet Boyd, Paisley – for picking up bricks when he is out and about and for taxiing me around Paisley on my visits and oh aye , for the patter too! Tom Slaven, Fife – for his goodwill and local knowledge and for the kind donations of bricks. Brian Wardell, Northumbria – for finding many a brick from the North of England area. and for dropping them off! David McGarrigle, Paisley – for spotting and donating some great bricks, including a rather elusive Inkermann. Robert Jamieson – for keeping his eyes peeled in North Ayrshire. Some lovely bricks have been donated from the area, which I doubt I would never have found myself. William Anderson and Alison Wilkie both of the Inverness area for their assistance in local dialogue, information, research, newspaper cuttings and photographs. Many thanks to you both. Dave and Rose Harvie, Dumbarton for their hospitality and local knowledge. Elma and Pete Gallacher, Drum Farm, Bonnybridge for their permission to wander around their farm at will looking for bricks. Some lovely examples were found. A warm and friendly welcome is given whenever I appear. It is all much appreciated. Their local knowledge is much valued too. Harry Wilson, Bonnybridge. Harry is often here and there scouting out sites to visit and laying aside possible new examples for the collection. His knowledge of the Scottish brick industry in invaluable and I fully appreciate all his information and insight. John Bramall a particular huge thank you for all the insight into his career in the brick manufacturing industry. Hugely informative on the technology, products, company associations and day to day running of such enterprises. All very much appreciated. George Kennedy – what an absolute gent and a fount of knowledge for the Carluke and wider area. His local knowledge is second to none and his generosity in providing brick examples and volunteering to act as a local guide is very much appreciated. George is often assisted by 2 dedicated cohorts namely Sammy Robertson and Jacky Rafael. When I am able to accompany all 3 out scavenging for bricks, their patter and willingness to assist the ’cause’ are second to none. Thank you gentlemen. Jeanie and Peter Gordon – their hospitality and offer of assistance in supplying information on the Carty Tile Works was second to none and to top it all I was given a Carty tile and brick which I doubt I would have found on my own. Thanks folks. To Jock McMaster – a very enthusiastic gent with a very similar interest in Scottish history to mine. He took valuable time out to help me look for specimens in the Monreith area and topped it up by donating some cracking examples of brick and tile. Thank ye kindly. Andrew Gemmell – Andrew has picked up bricks for many years while out draining fields in the Milngarvie area North of Glasgow. Following a visit to see his collection he donated numerous bricks that I did not have in my own collection. An incredible gesture and one I very much appreciated. Many thanks Andrew. Jamie Wong – Jamie found a multitude of Scottish bricks along the St John River, Woodstock, New Brunswick, Canada. Several of these bricks remain unrecorded as being found in Scotland. Jamie kept looking for more examples and was instrumental in repatriating 3 of these old Scottish bricks back to the home land. Martin Sneddon – Martin has been a magnificent help in identifying areas in Kilwinning to search for bricks. He has proved and excellent guide and his hospitality and eagerness to assist in the project is second to none. His local knowledge, contacts and introductions have been invaluable. Many many thanks. Jeannie Cooper – Jeannie has scoured the Dundee area for bricks and keeps a wary eye out whenever she is out walking. She also acts as a ‘brick hub’ for the area and uplifts any donations so that they are all in the one place ready for collecting. Jeannie often drops these bricks off at my door when travelling south which is a huge help. Many thanks for your hospitality, good will and local knowledge. Nick Basden – Nick and his mother have collected bricks from teh 1970’s and very kindly dontated the bricks to my projects. Among them were some bricks I doubt I would ever have found by my own means. Nick also handed over a wealth of brick related literature which was full of fantastic information. Many thanks. John (Ian) Jones, Girvan – Ian donated some wonderful bricks and keeps an eye out locally. He also handed over a box full of brick related papers which simply oozes industrial interest. It will take some time to go through it all but I will get there! Many thanks.